Yosemite National Park is an incredible vacation destination, regardless of the time of year! If you’re craving a getaway with your special someone, Yosemite in winter is truly stunning. Discover everything you need to know about what Yosemite National Park is like this time of year and start making plans to visit! Yosemite National Park transforms into a magical, snowy wonderland during the winter! You should be informed of the weather conditions in Yosemite during this time of year so you know how to prepare for your winter getaway. The temperature of Yosemite Valley and Wawona usually averages around a high of 53 degrees Fahrenheit and a low of 28 degrees Fahrenheit. You’ll probably encounter some snow on the ground, and tire chains are required on vehicles when driving on the park roads. Rivers are generally pretty low, but Yosemite Falls in winter still flows (just not as much as it does in the spring). Many roads close during this time of year, including the Tioga Pass, so be sure to check the road closures in Yosemite National Park before visiting. There are so many fun activities to enjoy in Yosemite in winter! With the abundance of snow, you’ll be able to engage in a myriad of winter sports in the Yosemite Ski and Snowboard Area (formerly known as the Badger Pass Ski Area). Here, you can try downhill skiing, snowboarding, snowshoeing, cross country skiing, snow tubing, and even ice skating at their outdoor ice rink. Yosemite winter hiking is another beloved pastime. Although many trails are closed, there are many that are still accessible during the winter, such as the ones in the Yosemite Valley, which is open year-round for you to explore. Trails within the Hetch Hetchy region are usually available during the winter season as well. Wawona Meadow Loop and Wawona Swinging Bridge are two other places that are a treat to hike during the winter. After you’ve experienced an exciting day in the snow, stop by the Ahwahnee Hotel to warm up your fingers and toes by their cozy fire! You’ll need the best accommodations to unwind in after a thrilling day of journeying through Yosemite’s enchanting winter landscape. Conveniently located at the gateway of Yosemite, Hotel Charlotte is the finest lodging for you to stay in! 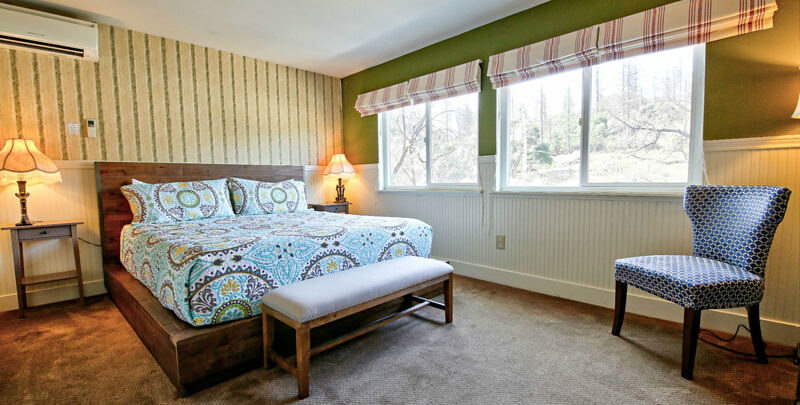 A historic bed and breakfast in Groveland, California, this spot offers comfortable furnishings and excellent amenities within a charming, rustic environment. Choose from staying in one of our twelve lovely rooms or renting one of our cozy vacation cottages. You can explore the many attractions of our surrounding town of Groveland, adventure through the magnificent Yosemite National Park, or simply spend time in our relaxing environment; we have an elegant living room, friendly and helpful staff, and even our very own restaurant to accommodate all of your needs! Don’t wait another minute to start planning your dream vacation; check our availability and book your stay today!